Apache Hadoop, an open source software framework this is very well designed to support data intensive distributed analytics involving thousands of nodes and petabytes of data as its core comprised of Hadoop distributed file systems and Map Reduce components. Fast, reliable analysis of unstructured and complex data made many enterprises to deploy Hadoop with their IT legacy systems. Hadoop was inspired by Google’s MapReduce and Google File System (GFS) papers. Over the years, various components have been added and it is evolving to handle various data challenges and needs businesses are facing today. HDFS – Hadoop Distributed File System (HDFS) is the primary storage system used by Hadoop applications. HDFS creates multiple replicas of data blocks and distributes them on compute nodes throughout a cluster to enable reliable, extremely rapid computations. The HDFS architecture deoptimizes time to access and optimizes time to read. The time required to access the first record is sacrificed to accelerate the time required to read a complete file. HDFS is therefore appropriate where a small number of large files are to be stored and processed. HBase – HBase is the Hadoop database. HBase provides the capability to perform random read/write access to data. HBase is architected as a distributed, versioned, column-oriented database that is designed to store very large tables — billions of rows with millions of columns using a cluster of commodity hardware. HBase is layered over HDFS and exploits its distributed storage architecture. MapReduce – Hadoop MapReduce is a programming model and software framework for writing applications that rapidly process vast amounts of data in parallel on large clusters of compute nodes. It essentially consists of jobs which have two functions, map and reduce, and a framework for running a large number of instances of these programs on commodity hardware. The map function reads a set of records from an input file, processes these records, and outputs a set of intermediate records. These output records take the generic form of (Key, Data). As part of the map function, a split function distributes the intermediate records across many buckets using a hash function. The reduce function then processes the intermediate records. HIVE – Hive is described as a data warehouse infrastructure built on top of Hadoop. Hive actually implements a query language (Hive QL), based on the SQL syntax, that can be used to access and transform data held within HDFS. The execution of a Hive QL statement generates a MapReduce job to transform the data as required by the Hive QL statement. Translating this to the RDBMS vernacular, Hive QL can be considered part view and part stored procedure. Two differentiators between Hive QL and SQL are that Hive QL jobs are optimized for scalability (all rows returned) not latency (first row returned) and Hive QL implements a subset of the SQL language. The other use cases need to be analyzed further to see if a broader solution base and customer base can be derived for further solution development. The various areas where large data, unstructured and semi-structured data is generated at a fast pace or need to be processed in a low latency space. It is clear from the data sets that the CDR, Network data, web usage data (including for web surfing, social interactions and content consumption – video, audio, shopping) are the key data sets that are relevant for Big Data elements. Emergence of Big Data – What is new way? Big Data is fast emerging as a technology trend for organizations to leverage large volume of variety of data (structured, unstructured and semi structured) generated at a high velocity, for analysis and deriving better insights for their business. Cassandra etc run on low-cost commodity servers and with a fraction or no license cost – they have spontaneously focused on the new area that was previously untapped. So from both business and technical solution perspective, we can now think about and aspire to put together an analytics solution that was earlier a dream. Traditionally, telcos are using traditional RDBMS and appliances like Teradata, Netezza, Exadata to process their volumes CDR and Network data. It is a fact that these solutions have come up to handle mass data processing requirements but they bring huge amount of obligations along with them. Big Data analytics is most appropriate for addressing strategic decisions based on very large data volume. It can handle larger volumes of data as compared to Enterprise Data Warehouses and has a capability of handling non-structured data (semi, quasi and unstructured). Currently it is not suitable for Real time analytics. Complex processing of data can be enabled using Big Data technologies. Google added AppEngine-MapReduce to support running Hadoop 0.20 programs on Google App Engine. EMC released EMC Greenplum Community Edition and EMC Greenplum HD Enterprise Edition in May 2011. The community edition, with optional for-fee technical support, consists of Hadoop, HDFS, HBase, Hive, and the ZooKeeper configuration service. In June 2011, Yahoo! and Benchmark Capital formed Hortonworks Inc., whose focus is on making Hadoop more robust and easier to install, manage and use for enterprise users. 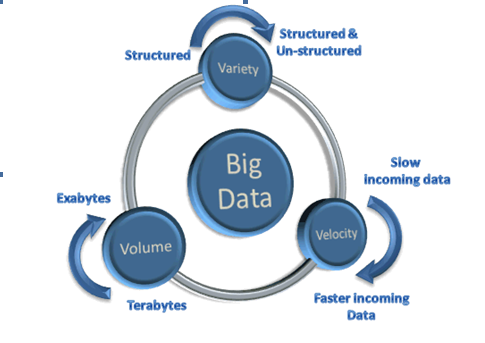 Big data spans three dimensions: Variety, Velocity and Volume. Which data is big data? Big data is more than a challenge; it is an opportunity to find insight in new and emerging types of data, to make business more agile, and to answer questions that, in the past, were beyond reach.